The Winter 2015 Update has brought a new dye system to Ragnarok 2. With the Multi-Dye System, you can dye some new costumes, armors, and transmogrification items in up to three different places, with up to three different (or same!) colors. The dye window looks familiar, but there are now three parts that can be dyed: Part A, Part B, and Part C. You can only dye one section at a time. 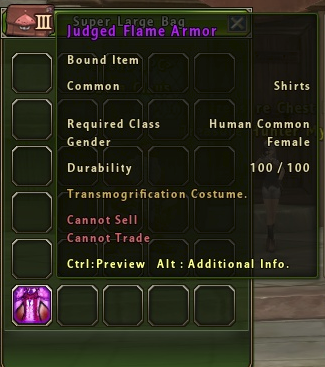 Five new sets of Transmogrification Items have been added. When equipped, these items take up normal armor slots. They are meant to be used as skins for existing armor. To learn more about Transmogrification, please visit the Official Guide. These items can be colored before you Transmogrify them onto a new armor piece and will retain the dyes you have applied.